This was the first car we had ever created. Though this car's design was quite basic and wasn't made of complex materials like Carbon Fiber like our newer cars, it got the job done. That job being that we needed a car that could run, be fairly fuel efficient, and make it to Houston. This car was able to do all of that, which made it a big success for us. Our second car to ever be built is what we call Bear 1. This car is powered by a Briggs and Stratton Junior 206 gas engine. 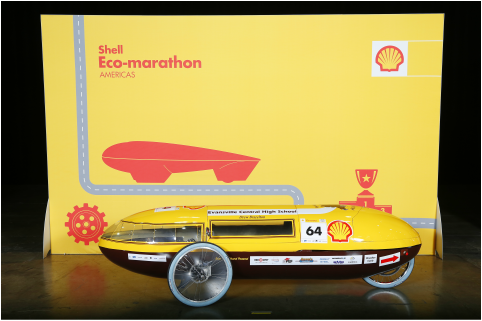 The first time it ever competed was in Houston, Texas at Shell's Eco Marathon in 2013. During this event, the vehicle achieved a maximum fuel economy rating of 300miles per gallon. Later in 2013, we took the same car to a smaller event in Indianapolis, Indiana, and the car achieved a maximum fuel economy rating of 309.24 miles per gallon. This car weighs a total of 150 pounds. This car, being only our second car definentaly could use some improvements, but it is a strong competitor, and shows exactly what you can achieve with a few tweaks. Our third car, is Bear 2, which is powered by a Honda GX50 Ethanol engine. When designing this car, we decided to go with an slightly different body style than the one Bear 1 used. We needed to find a way to make major improvements, and changing the body style seemed like a good start. so, for this body, we did some reshaping, taking into consideration the weight of the materials, aerodynamics, etc. In doing this, we shaved 32 pounds off our car's weight, which weighs a total of 118 pounds. 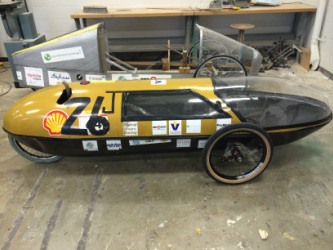 This car competed in Houston, Texas at Shell's Eco Marathon Event in 2014. This being said, due to mechanical and human error, the car never got to complete an entire run. Our fourth car, Bear 3, which is a electric battery powered car performed fairly well. With this being our first year producing an electric vehicle, we'd like to say that things went extremely well. Granted, we didn't do as well as some of the other competitors, we ended up placing 10th out of the entire competition of electric vehicles in Houston, Texas.